Shine beams of light from this rocket! The Reflector by Estes features a huge payload section intended for heavy duty lifting on standard engines. With its unique shape and squared fin design, this rocket will join a long list of popular Estes payload rockets. The Reflector stands over 20 inches tall and flies on standard Estes engines. The immense payload section is over an inch in diameter and can be filled with all sorts of fun things from bugs to small action figures. Try some hard candy and see how high your rocket flies. As a science experiment, see how your payload withstands a suborbital journey when boosted to cloud base. This easy to build kit features our high quality body tubes, a wood nose cone, laser cut wood fins and easy to apply waterslide decals. After being launched to over 750 feet high, recovery of your space cargo is accomplished on a colorful 12 inch preassembled parachute. 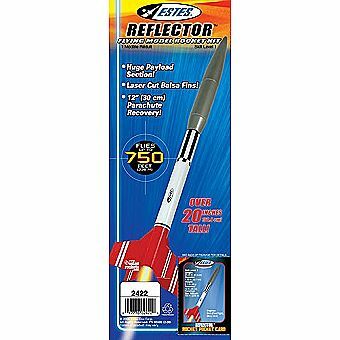 The Reflector is a perfect choice for the first time payload rocket builder!